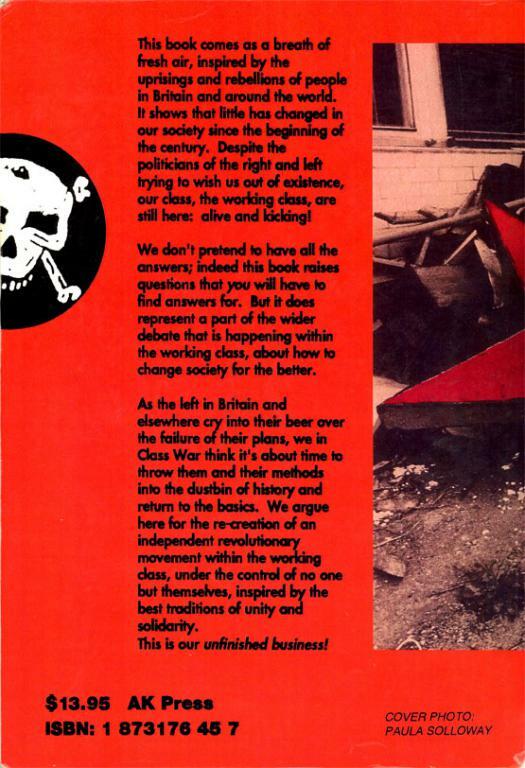 The definitive book about the politics of the Class War Federation, including brief histories and descriptions of the capitalist system and how it functions. Published in 1992. The book describes a three-class model of society - ruling, working and middle classes. It directs large amounts of vitriol at the "middle class" of which it fails provide an adequately description. It in fact defines large amounts of the working class as being part of the middle, but then tries to put sections of the "middle class" - by their own definition - into the "working class" so that their classifications do not look silly. For example, nurses and soldiers it correctly places in the working class, but by their definitions they would be part of the middle class. With all we have said so far you might think we hate all middle class people. Not so. Their class has a history of producing courageous fighters against oppression that they can be well proud of. While there is much that is distasteful about the activities of the middle class as a whole we recognise the fact that before and during a revolution the middle class will split and part of it will side with our class. Just as we know that the working class will split during a revolution and part of it will side with the bosses. ... though this is quickly forgotten. It also shows support for "national liberation" struggles, which as internationalists we do not. Other texts in our library deal with this question.